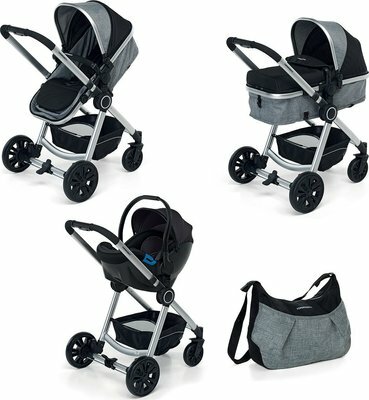 “Duo” travel system with a seat that can be easily transformed. The car seat approved for the 0+ group. Car seat can be attached to the aluminium chassis. The stroller seat is reversible. The Bikini Plus is easily transformed into carrycot, suitable for the baby’s first months. The storage basket is very large. The rear wheels are fitted with an adjustable shock absorber. Swing-open bumper bar. Window to see your baby. The carrycot may not be used without the frame Storage basket. Adjustable footrest. Front swivel wheels with locking device.